Graeme came to see us before Christmas to help us make our beautiful Cavapoo the best dog she could be. While she was generally well behaved she would only walk well on a harness, barked like mad when anyone came to the house and would sometimes run off, refuse to come back and would bark at strangers ; unsettling for anyone who didn’t know that she doesn’t have an aggressive bone in her body! Immediately Graeme seemed to get the measure of Nancy and the discussion with him around the table was so insightful into dog behaviour. Nancy trotted off with Graeme on a lead ( no harness) immediately as if she was showing at Crufts , we learned how to control her barking and to start her recall training. She is still a work in progress and it will be down to us ensuring we take the time to do the training we learned. We would absolutely recommend that if you are worried or inconvenienced by your dogs behaviour give Graeme a call! He will make a real difference ! Totally amazing man is Graeme ! 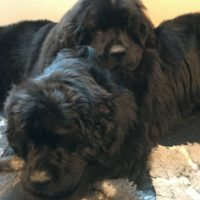 Within a few minutes of walking our dogs he had them both under control .Not easy with two huge Newfoundland’s and all done in kindness ,and not even a raised voice ,just very calm and confident . .We are so happy that we can now take them out without being dragged to every dog we pass . Also they would chase the lawn mower !! I would recommend Graeme to anyone with any dog problems without hesitation . Lovely man who clearly loves and respects dogs . Graeme came to see us and our cross Cocker Spaniel Bassett Hound, Maggie, today. Maggie is a squishy loveable pup – to us. To the rest of the world, she has resembled a savage crazed beast as she loses her mind in a mixture of fear and anxiety when she encounters new people and dogs she doesn’t know – not any more though! Graeme has shown us how to keep her down off the ceiling and make the most of her good behaviours, and given us the confidence to both invite people to the house and to take her out and about. It’ll be a long road ahead, but we feel like there’s hope for both us and Maggie to enjoy a calmer, happier life. Having adopted two very lively dogs, a 3 year old flat coated retriever and her son an 11 month cross. My arms were being pulled out of their sockets and lead untangling skills were being sorely tested. My wife’s fabulous garden was resembling a battleground and the wildlife pond had become the dog pond. In addition the bird of prey I have for work (although safe in an aviary) was having a nervous breakdown with the dogs sneaking up and getting excited. Then along comes Graeme, and within 4 hours we had calm and obedience. The results border on amazing and are so simple to use and enforce. I took both dogs out on a 2 mile walk 3 hours after Graeme had left us and it was a delight. No pulling, just fun. We still accept that there is work to do but now my wife and I have the techniques and confidence to think like a dog and enjoy them for what they are, two great pals. Better than any other dog training I have had with previously owned dogs. Would highly recommend the investment. It’s taken me almost 10 months to post my review since Graeme visited my home. (sorry Graeme) I have had a multitude of things to deal with, in retraining my dog Murphy from complex behavioural and anxiety issues to basic stuff too. The basic things were like retraining him on the lead which to be honest Graeme fixed in an instant and it’s never gone backwards since and he helped to stop him barking at the postman etc. I was amazed!! He thought me very simple techniques for lead walking and recall which was fixed very quickly indeed. After a really detailed discussion regarding Murphy’s life experiences and medical history of 6 years, (as I had him since he was a puppy) we soon got down to the serious business of educating me and then the dog, in that exact order. As soon as he took Murphy under his wing, he was like a very different dog. Murphy soon realised who was in charge – and that is the key word here. He didn’t use an aggressive approach, just firm words and body language. He thought me many things relating to Murphy’s body language and about modifying his behaviour. During this session I learnt about how crucial key timings are i.e. 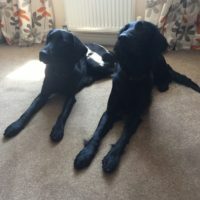 taking leadership and knowing when to reward for good behaviour and when to ignore for bad behaviour because my dog WAS a bit (a lot) of an attention seeker. He tried to interrupt many a discussion that Graeme and I were having! Since his visit, I have learned how to communicate better and more effectively with my dog and I am seeing the results to this day. He truly does know who is in charge now and we are reaping the benefits. Graeme has since been on the end of the phone when I needed extra help or advice. I would strongly recommend The Dogfather to anyone and I actually have passed on his contact details to friends and family since. Thank you once again to Graeme and his office staff for all their guidance and support. Graeme came to us just over a year ago to work with our nervous dog Cookie. She had never liked being too close to dogs out on a walk, and showed that by barking at them to keep them away. Graeme quickly taught us to walk her without the barking and pulling. We didn’t think she would be safe walking off the lead with other dogs present, despite us introducing two new puppies into the household. However, ou4 dogwalker started taking her out with ‘selected’ dogs and she has come on in leaps and bounds – see picture. Without Graeme starting this process off, we wouldn’t be in the situation we are in now. It even means that our youngest, Rocko, gets to go walkies with his brother Alfie! 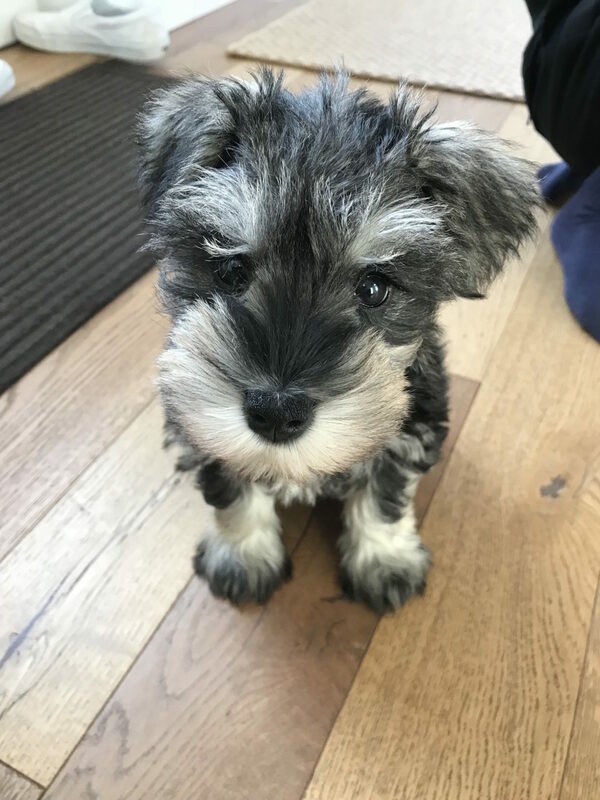 Our family have never owned a dog before and have taken the big step of buying a Miniature Schnauzer. The proviso of having a dog was that it would be well trained and be able to fit in with our family life. I then proceeded to read every book on puppy training that has ever been written and frankly ended up very confused. This is where the idea of Graeme came in! He spent 3 hours with us all today and has given us the tools to help bring up a well mannered dog. The books seem to miss the whole psychology bit of training which having spent time with Graeme seems to be the crux of the whole thing. I would highly recommend hiring Graeme before embarking on the bringing up of a puppy. Review: Prior to Graeme’s visit we had 4 very badly behaved Bolognese dogs. We cannot believe the transformation in such a short space of time. ( 2 days ) . Amazing is the word that comes to mind. We would recommend Graeme to everyone having problems with their pets. We would just like to say a very big thank you to Graeme for the amazing work he does. 7 days on, here’s a little update: All dogs are improving wonderfully. Franco still trying to pull on the lead, but once we get the correct collar we will notice the difference. I have just taken all 5 dogs out down town and back by myself – Amazing.!!!!!!! Well what can I say, we have a very excitable 4 year old boxer, which I spoilt as a puppy. We needed help with controlling his excitement not only in the house but on the lead. Within minutes of Lenny being let loose on Graham, he had Lenny sat between his feet very calm, I would never have believed it if I hadn’t seen it with my own eyes, absolutely amazing. Waking him was like having a real life tigger on the end of a lead with no control, so it was no pleasure walking him. Graham however calmed him and made it look very easy of course. Graham showed us the lead/collar he uses and I found myself buying a one as it worked for Lenny. After the tips/advice Graham gave us, its still a work in progress but its working brilliantly, I have a dog I like walking and have more control over him. Its not me just training my dog , I’m also training myself. Would like to take this opportunity to say thank you very much Graham you are an absolute super star. 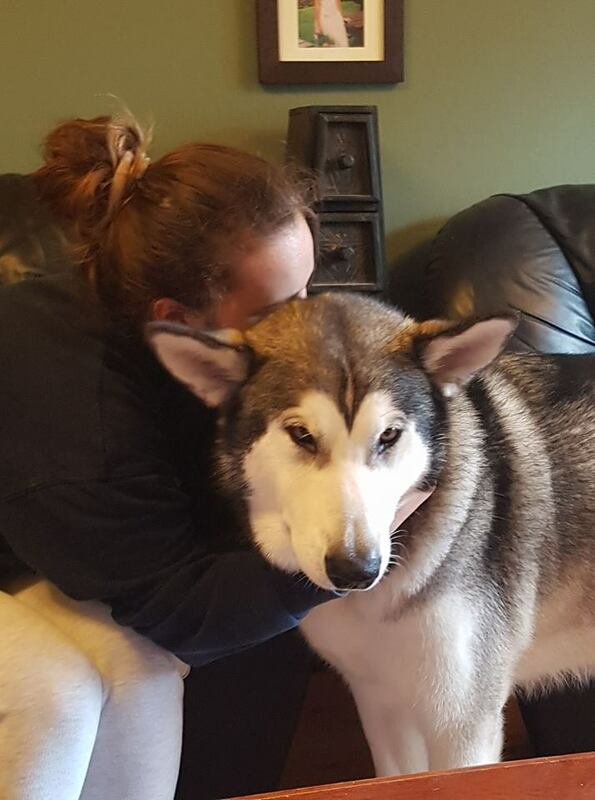 Logan is an Alaskan Malamute who is now 15 months. 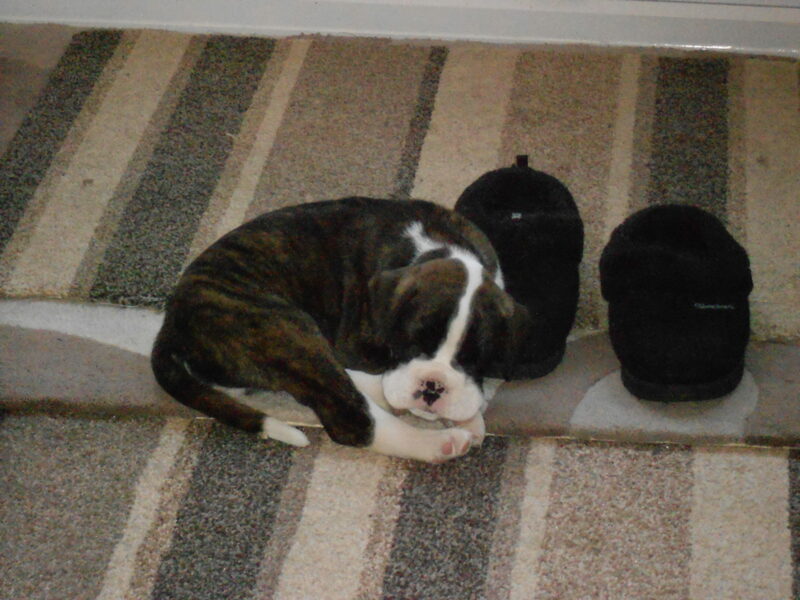 One moment we had a cute little puppy but within 8 months he was 45kg, stubborn, continually trying to dominate all in the household, walking him was the worst nightmare my arms were seriously bruised from him jumping up and biting them. There was no pleasure in being with him and after a very bad experience with a dog trainer who came to our house, stirred Logan up so much that he became aggressive towards me and left telling us that we need to get rid of him and that he had serious issues with me in particular.